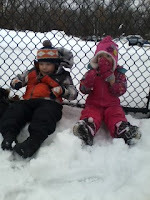 The snow is sticking around and although there are days we long for spring, the white stuff provides lots of outdoor fun at Cameron's school. Cam arrives in his winter gear- snowpants, coat, hat and mittens and is ready to head out to the playground right when he gets off his bus. 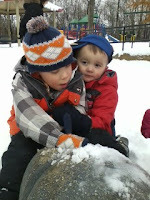 Pictured with him are friends, Carter and Morgan enjoying the outside playtime. Some days, it's also advantageous to stay inside. Cam's buddy, Emma, had a "snowball fight" with him with the fluffy, soft-stuffed "indoor snowballs." After playing with the inside snow, it was time to get warm with the George blanket. Cam thinks it is totally hilarious when Emma does her super silly faces! The George blanket had quite a bit of use when Emma's family headed over Friday evening to visit and play some games on the iPad. Like curious, like curious, like Curious George!